It “warms my heart” when an NBA personality humanizes himself with a hint of self-awareness. It’s a small moment where he lets me know it is OK to spend hours of my day watching sports coverage because someone within the game “gets it.” Conversely, it’s really disorienting to watch any sports personality recite a bunch of meaningless jargon in high definition. Are the most likable NBA players more self-aware than ever, or are they just afraid of being made fun of by Charles Barkley and Kenny Smith, the leaders of the self-awareness movement in the mainstream NBA media? The first time Jason Terry drove a car was when he was 14 years old. His mother was going into labor in the backseat. This story about Jason Terry’s life could open up discussions about a socioeconomic divide in America, driving laws, or commentary on prenatal healthcare, but my first thought upon hearing this story was, “Now that’s a guy who knows his role, and will do anything for his team!” Now, I am no longer annoyed when Jason Terry does “the airplane celebration” after he makes a 3. Instead, I can project that Jason Terry is aware that he is on a big stage, and is simply “embracing the moment” that represents his absurd life. Outside of helping moms and driving underage, what can a member of the NBA family do to let us know that they are self-aware? Shaq could make us chuckle in a postgame interview by cracking a joke about Craig Sager’s jacket. Allen Iverson’s “We talkin’ bout practice” and Rasheed Wallace’s “Both teams played hard” press conferences helped to shatter the formality of the standard press conference. Gregg Popovich can make an in-game interviewer realize that he or she has the saddest telejournalism job in the sports entertainment landscape. Mark Cuban inspired the entire NBA media to applaud him for “finally shutting up” during the Mavericks’ playoff run. How does our perception of a self-aware NBA player change the way we analyze their career in the present and the future? I feel bad for so many young players after watching 2011 NBA playoffs. Kevin Durant disappeared. 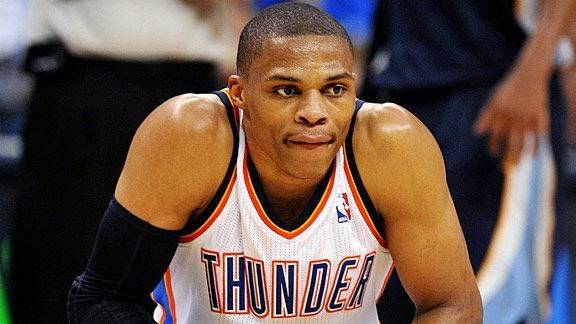 Russell Westbrook is the new Stephon Marbury. Derrick Rose shoots too much. Dwight Howard will never make his teammates better. (Also, Ricky Rubio apparently isn’t good anymore, and he has never played an NBA game.) It just seems way more difficult for young players to “take their lumps” now than it was 10 years ago. They have more voices that are there to question their abilities, when in the past a player really just needed a few commercial spots to convince him that he was already “great when he was averaging 20 points per game on the Vancouver Grizzlies. I probably would have rather been a young player back then, not just because of my fragile psyche, but also because of the favorable rookie pay scale. These young men are working against opinions that are as valuable and informed as your own. Think about the face that Skip Bayless makes when someone else is talking, listening intently, mainly because he is waiting for his turn to present a passionate, logical counterpoint. This face represents the drive behind the modern sports fan to “stay connected” in order to form his or her own informed opinion. Young players must create shelter in self-aware musings and personal revelations to fight against the constant comparison against legendary NBA players. Derrick Rose shared one of his first “real” moments with the general public when he fought back tears as he talked about his single mother, Brenda. The moment humanized his struggle and MVP-character arc. Legends like @LarryBird33, @IceMan44, and @MikanDrill didn’t have to worry about why they were trending on Twitter. These young guys aren’t really helping themselves by wearing costumes to postgame press conferences. Shaq’s earlier years seem way more interesting than his later years, but probably because the 1990s are finally as funny as the 1980s. The Orlando Magic-era Shaq embraced the brand of invincibility, humiliating opponents, and breaking down backboards. 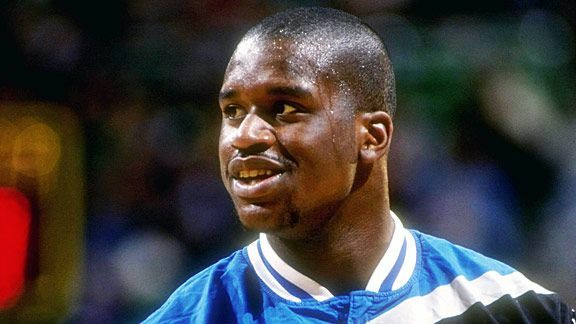 He pursued Hollywood fame in Los Angeles, starring in Blue Chips and Kazaam, because back then everyone thought being on a big screen made you really famous. He had a bad breakup with Kobe Bryant after a few playoff successes and tragedies. He almost tricked us into blaming Kobe for breaking up their potential dynasty. Will we ever really know if Shaq was self-aware before he reached the Heat? To me, he was a living video-game character who bought Mark Madsen a car one time. When exactly did Shaquille O’Neal acquire a “self-aware” brand? After Dwyane Wade led the Miami Heat to the NBA championship in 2006, Shaq was forced to make a public gesture that let everyone know that he was OK with being a sidekick. After clinching the series in Game 6, he took the Finals MVP trophy from David Stern and presented it to Dwyane Wade, symbolically letting the whole world know that he was cool with the changing of the guard. (Probably to let people know that he could get along with another shooting guard who closed games.) Did insecurity force him into this act, or was he distancing himself from his now laughable and completely dated Superman brand? Role players don’t have the pressure of micromanaging their individual legacy. They just need one or two decent contracts and the chance to achieve “collective greatness” during a championship season. For role players, self-awareness is not a personal branding tool. Even if they were college stars, when they enter the NBA, role players are basically forced to accept the limitations of their skills and rapidly adapt to their role within a team in order to thrive as a player and keep a job in the NBA. Jason Terry scores the points that Dirk doesn’t score. 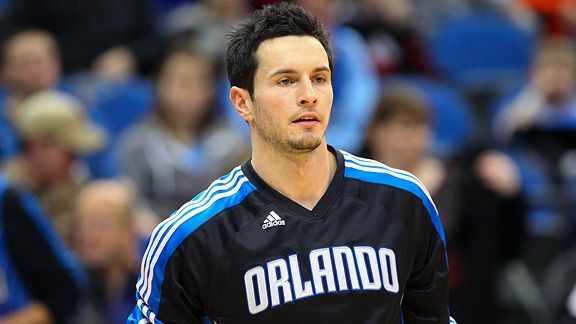 J.J. Redick knows he is “the white guy from Duke whom everyone hates who is really good at shooting 3s.” Steve Kerr always found himself on great teams because he understood that he could really only shoot 3s. Bruce Bowen just played defense and learned how to shoot 3s from the corner. Brian Scalabrine knows he just has to stay positive and wear a collared shirt and a blazer. Jack Haley just had to make sure Dennis Rodman showed up to the games. For role players, self-awareness is a necessary tool for survival, not a public-relations strategy. It’s so humanizing when a role player get a postgame interview, and admits that he knows he is not the reason people are filling the seats. That’s why Chris Bosh kills so many vibes. His personal brand doesn’t connect with our perception of him as a role player. Role players are usually the self-aware foundation of the NBA, providing insight into the A-list stars and the emotional state of the locker room. Are some athletes too self-aware? The classic example is Ricky Williams. He ended up going AWOL and smoking tons of weed. 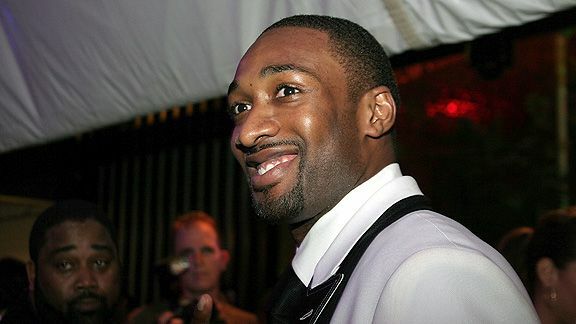 You could make a case that Gilbert Arenas’ venture into blogging led him toward acquiring a self-aware brand, but then it all unraveled very quickly, and now he just seems crazy and out of touch with reality. Arenas is representative of the media and a rabid fan base’s desire to project self-awareness onto a personality who merely shares his thoughts too freely. Controversy will usually force an athlete to go on a quest for self-awareness if they want to keep their career alive. The most extreme example is Ron Artest. After the 2004 Pistons-Pacers brawl, it seemed like there was a chance that he would have to take his talents to China. But after what seemed like some healthy therapy to help him to confront psychological issues that inspired acts of anger, he now seems cerebral and honest. What other choice did he have to save his career in the NBA? Self-awareness can lead you into existential dilemmas, darkness, and a desire to exist outside of society’s expectations of you. Maybe we don’t want athletes who are TOO self-aware all of the time. Players who skipped college have allowed their lives to be defined by their performance on the court. (Note: Tim Duncan graduated from Wake Forest University with a degree in Psychology.) Kevin Garnett and Kobe Bryant don’t seem as out of touch with reality now that they have won championships and their existences are finally less uncomfortable to try to process. But we will never be convinced that they are self-aware. 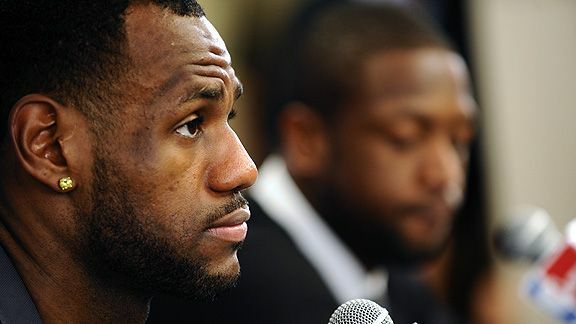 Even when LeBron wins his championships, will he ever really emotionally resonate with us? Robots who win championships are sweet when they win for your hometown team, but since they are robots, we get to emotionally abuse them because they don’t have feelings. We don’t hate LeBron because The Decision was a bad idea, we hate LeBron because he didn’t realize that The Decision was a bad idea. In the 2011 NBA Finals, we are able to process Dirk as self-aware because of his lucidity after his playoff tragedies. He knows how bad he needs a championship to escape from the Karl Malone Zone, and we can respect that. Dwyane is a champion, Dirk is self-aware, and LeBron is screwed as the poster child of “branded self-awareness,” which is just as transparent as the “branded greatness” that has lingered since the immediate post-Jordan era. LeBron probably just needs to cry when he wins a title and he’ll be pretty humanized and pitied, even if there is no public epiphany. What do I want in a self-aware athlete? I want to root for an athlete who accepts that he has a genetic gift that enabled him to make more money than me, even though I potentially do something that is more valuable to my city’s local economy. I need an athlete to remind me that it is “just a game” every now and then without making me cry about an off-the-field issue that is “too real.” I want to sort out levels of “greatness” later, and enjoy the personalities of the game. We’ve heard plenty of athletes thank God, thank their teammates, take it one game at a time, and give respect to their worthy opponents. We’ve also heard great players talk about how they led their team to greatness. Even if these lines and emotions came from a “real place,” they just don’t really inspire an authentic emotional connection to the modern sporting experience. Let’s get self-aware. Let’s get vulnerable. The Top Five: One Writer's Sometimes-Relevant, Never-Boring Breakdown of This Week's "News"